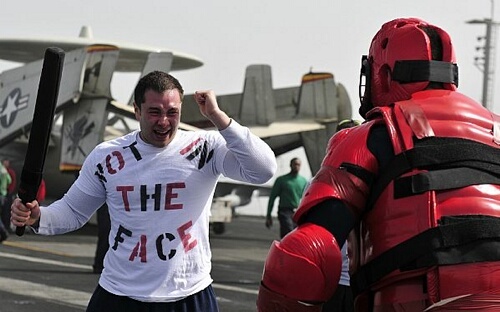 Pepper spray “familiarization” is old hat for master-at-arms sailors. But I’m guessing that not all those who volunteer for security department duty know what they’re getting into when they raise their right hand. Given the message on the shirt, Chapman knew what was coming on this particular day. Looks like someone didn’t take his advice. Yo! Isn’t that the guy that washes dishes? Oh wait, that’s the dude who separates trash! !… Yeaahhh.